A familiar barroom drama turns into an in-depth exploration of the 30-something singles-scene psyche in the world premiere of Kelly McAllister's three-hander, Some Unfortunate Hour. 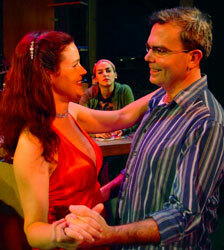 Building on his previous successes (including Last Call, which won the 2002 FringeNYC Excellence in Playwriting), the scribe's dialogue rings true while head case Tom, seductive charmer Charity, and quick-witted barkeep Janus at first dance around and then fully engage their unbottled emotions. Direct from signing divorce papers at the courthouse, Tom and his irrepressible alter-ego "Mad Tom O'Bedlam" seek refuge in the libations and sympathetic banter offered at Janus' run-down, intimate watering hole. Dan O'Neill does yeoman's work with McAllister's dense and lengthy rants on love, betrayal, and the male animal, unshelling the nut of Tom's peculiar madness. Helmer Martin McGovern and illuminator Mariah Becerra frame Tom's id-driven outbursts of confessional and poetic fireworks with pointed mood changes, highlighting his seething emotional broth. O'Neill's feel for the material (he read the role at the New York International Fringe Festival 2005) comes through in his conviction battling Tom's demons, which include his ex- ("the one whose name cannot be spoken") and his degrading, fixed notion of masculine behavior. Perf is topped off by O'Neill standing on a chair, threatening to disrobe, while reciting the famous 17th century poem ("Mad Tom O'Bedlam") that recounts the crazed, naked beggars so common along Elizabethan roadsides. Overhearing Tom's opening lamentation on the three great Christian virtues, an auburn-haired siren in a slinky red dress (Elgin Kelley) tells him her name is Charity and offers the poor man her attentions and a taste of her delights. Kelley paints a guileless, no-nonsense picture of Charity, her earnest efforts all the more heart-wrenching in the face of Tom's ineptitude. We sit helplessly—denied by convention from grabbing Tom by the lapels to tell him to shut up and relax, or from buying Charity a drink and making time ourselves—as Tom's non-stop ego derails Charity's efforts to get him into the moment and the sack. Karen Slack's Janus is the secret ingredient in this incendiary cocktail, lulling us with the security of spotless glasses, smooth one-liners, and a bottomless well, while she lies in wait. When Tom finally exhausts Charity's patience, Slack totally disarms us with Janus' courageous monologue, laying bear her heart. McAllister immediately follows with a twist that liberates Some Unfortunate Hour from the usual humdrum arcs of crying-in-my-beer memoirs, sending us home chewing on Tom's cathartic decision to end his pattern of victimization and take control of his life.